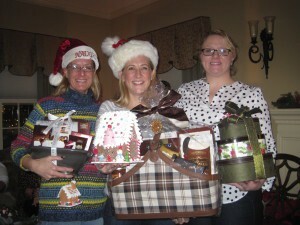 What a wonderful 2014 year it has been and especially when the 10th Annual Cookie Exchange, which occurred on Dec. 15 at Kim Villani’s house in Moorestown. A combination of 35 women (friends, family and colleagues) showed off their incredible cooking talents. Most cookie exchanges don’t continue as long as this one, but each year the members that come out say it’s a tradition that they look forward to each year. Furthermore their children, young and old, get to consume the confections when mom gets home. I get status reports during the year that a baker has already started planning out their next cookie creation for the next exchange. The members of the event know also that even though they do select the first, second and third place winners … they are all winners at the Villani house. There is always a great selection of cookies and a treats under the Christmas tree from Santa.This year’s winning Bakers were Melissa King with first place, Alexandra Villani with second and Brandi Nice with third.